Christian Treney and rest of the Jersey Shore Boca men’s open team will seek to bring home some coveted hardware this week as they square-off against the Newark Enforcers on Wednesday night June 4 under the lights at the Manalapan Recreation Complex in the New Jersey State Open Cup Championship. Kick-off is scheduled at 8pm and is open to the general public with free admission. BERKELEY TWP, NJ (May 30, 2008) – The Jersey Shore Boca men’s open team will seek to bring home some coveted hardware this week as they square-off against the Newark Enforcers on Wednesday night June 4 under the lights at the Manalapan Recreation Complex in the New Jersey State Open Cup Championship. The match kick-off is scheduled for 8pm as announced by the New Jersey Soccer Association, the governing body for the Cup. 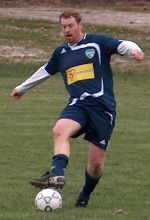 Boca advanced to the Championship by downing the Spring Street Strikers from northern New Jersey 4-2 on May 21 at the Berkeley Soccer Complex in the Cup Semi-Finals. Lithuanian born Tomas Banionis of Berkeley Township paced Boca against Spring Street with two goals while Stevens Tech graduate Christian Pontier (Forked River) and former Monmouth University standout and Southern Regional HS Hall of Famer Guy Lockwood (Manahawkin) added one strike each. Newark defeated Elizabeth Pegasus 6-3 in a high scoring affair to earn their place in the Championship. The NJ State Open Cup Championship game is open to the general public and admission is free. Former shore area standouts Ryan Applegate of Central Regional and Rowan University and Christian Treney of Toms River East and Methodist College are player-coaches of the Boca men’s team. The Boca men previously captured the NJ State Open Cup Championship in 2004. In other news, the Boca women’s open team dropped their NJ State Open Cup Semi-Final game against a tough Real Wyckoff side 4-2 also played at the Berkeley Soccer Complex on May 21. Former Brick Memorial and Rider University star Stephanie Best (Brick) and Toms River South and LIU standout Jenae Piper (Pine Beach) scored for Boca in the loss. The Club is celebrating their 30-year anniversary in 2008.